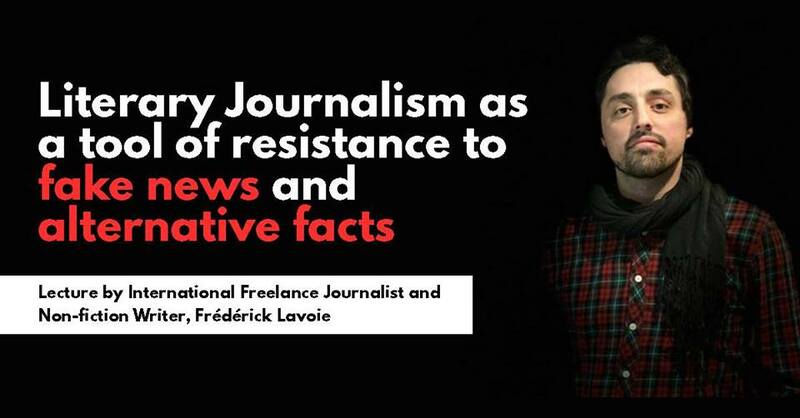 Consulate General of Canada in Mumbai and Alliance Francaise d’Ahmedabad presents a lecture followed by an interaction with Frederick Lavoie, international freelance journalist and nonfiction writer. In this lecture/interaction, Lavoie will underscore the utility of literary journalism as a tool of resistance to fake news, to alternative facts and to all those trying to make us believe that two and two make five, especially in the current scenario. In his practice and as a reporter, Lavoie goes on the ground, gathers contradictory points of view, establishes facts and chronicles events. Then, as a writer, he transforms his investigations and travels into books, in which he recounts the complexities of the human experience in the face of turbulence of history: the long-lasting effects of the collapse of the Soviet empire, life on both sides of the front-line in war-torn Ukraine, the period of transition between two eras in Cuba and the strained relationship between India and Pakistan. Entry on First come first serve. Limited seats.